Kat Von D fans are devoted to her Lock-it liquid foundation due to its full coverage formula. The powder version of Kat Von D’s Lock-it Foundation has quickly become a Sephora best seller and it’s easy to understand why. The powder edition is equally as buildable as its liquid counterpart. But it’s also light enough to allow skin to breathe. It lasts and lasts, and will blur out those pesky blemishes and breakouts, dark spots, pores, fine lines, or whatever ails your skin. If you prefer a powder formula for warmer days so you can swipe and go without having to buff and blend in order to disperse the product but don’t want to skimp on the coverage, then say hello to your new everyday skin fixer. It’s formulated with rice powder so you get all the benefits of a soft focus, matte finish without feeling dry or cakey. There is a wide range of shades with 26 options so it’s somewhat inclusive, too. You can use as little or as much as you need to achieve your desired look. I swipe on a blush brush over the pan twice and then sweep in circles over my bare face. You can also use a layer of this powder to set liquid foundation and as a finish to your face before applying blush or bronzer. No matter your skin type — oily, dry, combination — Lock-it works wonders for your base face. 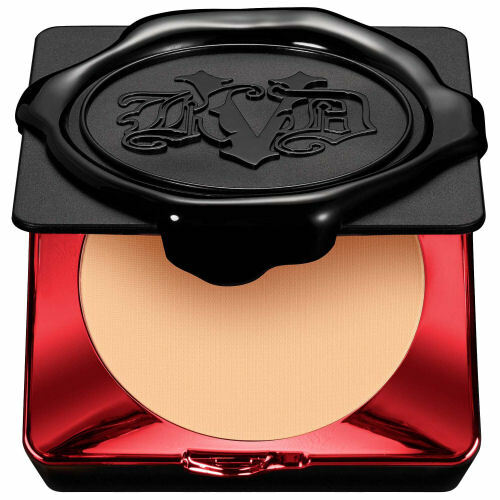 The compact also features all the KvD hallmarks; it’s black, red, gothic, and cool. You will want to figure out a creative way to repurpose it as decor rather than recycling it once you’ve hit pan.